Mission-critical networks require carrier-class telecommunications equipment. Equipment designed for a carrier environment meet stringent specifications and features for reliability, safety, and scalability. Free Space Optics – also called FSO, Optical Wireless, Laser Link, Laser, Infrared – is still a valuable transmission option in many countries worldwide, not requiring frequency licenses or suffering interference, and being highly secure. Free-space optical technology is still evolving – a variety of systems are now being deployed for metropolitan area applications. However, not all FSO equipment meets with telecommunications carriers requirements. One of the major reliability issues with FSO is the effects of weather such as fog, snow and dust storms on transmission. The most severe effect on transmission is thick fog, experienced in parts of Northern Europe during winter months. To counter this heavy attenuation, a large ‘fade margin’ is required – the difference in power required to penetrate bad versus clear weather conditions. A tough target for FSO systems is to achieve the 99.999% per-link availability required by service providers. In practice, some vendors have proven success even in foggy countries like the UK, typically on short (<500m) links; elsewhere, in low-fog regions, similar availability on longer links (2km or more) is possible. FSO products are used for a variety of applications. For some, high data rates such as 1.25Gbps and 2.7Gbps are required; for others, such as cellular back-haul, lower bandwidths of 4x T1/E1 (4x2Mbps) are essential. Range performance is key for many users. FSO products that work reliably up to 4km are available. Beyond 4km, FSO is less suitable due to low availability in most regions. FSO products that offer plug-in upgrades from 2Mbps up to 622Mbps and 1.5Gbps are available to meet current and future carrier requirements. The upgrade process takes minutes, and there is no need to realign links. Investment in infrastructure is preserved. Sunlight entering an optical receiver reduces background noise, and ultimately may swamp the receiver with excess of solar energy – this could cause outage on links where the sun comes near the optical path. 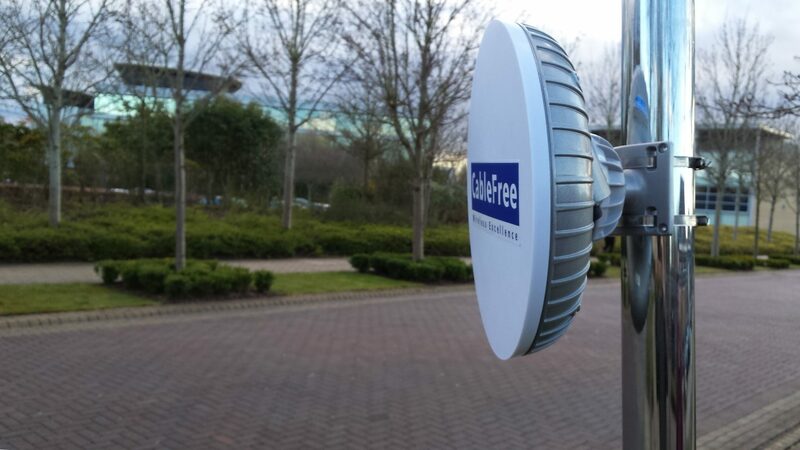 CableFree uses three-stage precision optical filtering to minimise risk of the solar outages – which would be time, season and site-dependent. Designed for ultra-quick alignment for temporary and mobile applications, some FSO systems can be aligned in seconds. Built-in voice, local and remote RSSI readout offers simple, foolproof alignment. Optics should be factory calibrated to avoid time-wasting on-site RX/TX tweaks. Remote-end telemetry means that a maintenance swap-out can be performed by a single operator without access to the remote site. Wide-beam technology and secure mounting methods avoid need to re-align. All buildings and mountings move with solar heating, wind and vibration. Some FSO systems have a typical beam divergence of 0.5 degrees (8mRad), which is adequate to provide reliable maintenance-free operation. Narrow-beam systems (<3mRad) require frequent adjustment, or overly complex, expensive auto-tracking technology to compensate. So tracking is needed on narrow beam systems only. In contrast to fibre-optic transmission, free-space optic systems require much high launch powers into the air to achieve any useful distance. One of the historic problems has been to provide adequate power and bandwidth with reliability; a common solution is to use multiple lasers, operating in parallel. For example, a 2km 622Mbps system uses 3 lasers, the outputs internally combined into a single high-performance beam. Some vendors use separate, small output beams, which after some distance overlap; in practice, this is gives worse performance in beam-break and scintillation than a single large aperture; safety is also worse for smaller apertures. FSO systems use solid-state devices such as lasers – for which lifetime is strongly affected by temperature. Laser manufacturers typically de-rate lifetime by as much as 50% for each 10deg C rise – remember – the system will usually be on the roof, not indoors – causing MTBF to vary considerably. FSO systems require solid-sate Peltier-effect cooling technology, also used in high-specification fibre systems to maintain constant laser temperature and hence predictable lifetime. With no cooling, reliability suffers in moderate or hot climates. Fan cooling is of no use, as the systems are typically outdoor-mounted, hence the unit is water sealed, and there is no air-flow. In cold weather, condensation, ice and snow build-up on optics causes major problems – usually link outages. To combat, FSO systems require integrates heaters which activate in the cold keeping optics frost-free and clear. Effects such as scintillation, or shimmer, cause optical beams to wander, or even break up at longer distances – causing significant burst-errors in transmission. Generally, the smaller or narrower the beam, the bigger is the problem. To combat these effects, large-area optics and divergent beams are required to ensure reliable error-free performance. For some applications, FSO alone is not enough; typically where ultra-high availability over very long distances is required. This can be provided by so-called ‘hybrid’ systems; in these, both FSO and microwave systems are deployed, with suitable routers to provide switch-over in the event of failure of either link. Typical examples are where a long link is required in high-fog areas which would cause FSO outage. An example Hybrid Microwave-FSO deployment for a major Internet company; a 2.4GHz unlicensed 11Mbps radio system provides low-capacity backup to the main Gigabit Ethernet FSO link. Also seen is a E1 FSO system. Modern networks are often complex, and need sophisticated tools to predict and identify faults. Optical Wireless systems, typically installed on the rooftop, are a prime example – if things go wrong, access to the roof compounds the time taken to identify and carry out a fix. FSO systems exist with powerful management tools, with on-board computers, remote access via cable, GSM dial-up or IP network, and a suite of management software capable of accessing and displaying results for up to 1,000 links. Critical features including generating install-time sign-off certificates, monitoring alarms, availability & BER, or arranging pre-emptive maintenance. Free Space Optics is increasingly deployed in modern carrier and enterprise networks. A generation of high-performance, reliable products with proven pedigree is now available, with sophisticated management and support tools to ensure trouble-free operation. FSO requires carrier-class engineering for use in a modern telecom network. In the current FSO market, vendors claims and equipment features need to be carefully checked.